What is our role in the grand scheme of things? In Psalm 21, the Spirit emphasizes our importance as God's "cheerleaders." We ask God to reveal himself in glory. We urge God to make his strength known to all people. We marvel in amazement at his great deeds. We praise God for all the incredible things he has done for us. 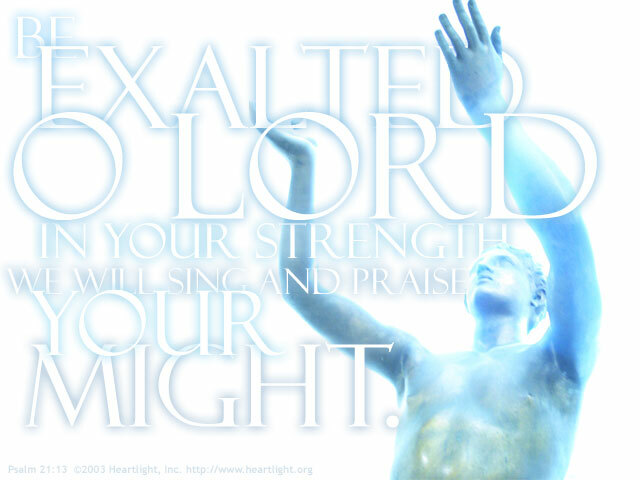 Dear Father in heaven, exalt yourself and your name above all things. I rededicate myself to daily praise and thanksgiving for all that you have done, all that you are doing, and all that you will do in the future. To you, the only true God, the Alpha and Omega, I offer my heartfelt praise and my songs of joy. In the name of the Lord Jesus, I pray. Amen.